POLYMERWERKSTATT GmbH is active in the service, manufacturing and research & development sectors of the plastics industry. We provide solutions made from plastic granules, with a portfolio of international projects spanning the construction, mobility, electrical & electronic engineering, medicine & health and sports & leisure industries. We are your professional partner for the development of material solutions based on sound research. As a result of this research, we are able to guarantee optimal levels of quality, efficiency and cost-effectiveness. Personalised guidance and the effective implementation of projects are our hallmarks. 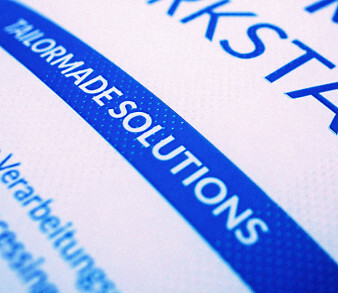 POLYMERWERKSTATT develops sophisticated plastic solutions for a wide range of industries. In doing so, we place a focus on the provision of personalised support and the development of custom-tailored plastics. Our innovative material combinations, cost-optimised selection of raw materials and forward-thinking technical solutions are developed on the basis of our on-site analyses and implemented with our core values in mind. Our tailored service is key to developing the perfect custom-fit plastic solution. Our custom-tailored compounds provide the optimal solution for any scenario. Functional additives and fillers – “modifiers”, to give them their more general name – are responsible for a significant percentage of modifications made to the properties of plastic products. The incorporation of these modifiers calls for a range of process and material-related considerations to be taken into account. They allow us to create enhanced structure-property relationships and better cost-benefit ratios for our customers. Our functional concentrates and masterbatches can fulfil any requirement. Concentrates are highly filled products containing pigments or additives. They require only small amounts of carrier substances – or no carrier subtances at all – to be used successfully. The mixtures we use are tailored to the project and/or customer at hand. Masterbatches are granules containing colours or additives, the concentrations of which are higher in the masterbatch than in the final application. Unlike with concentrates, it is not technically possible to gain full use of the masterbatches without introducing a carrier material. The precise imparting of colours to plastics can serve important functions. These colours can assume a signal function (such as in high pressure pipes) or a purely aesthetic one (such as in special applications for the everyday consumer goods sector). When colouring plastics, it is especially important to ensure compliance with standards for contact with foodstuffs as well as with other health-related legal provisions. Most companies now have sustainable aims anchored in their philosophies. With this in mind, POLYMERWERKSTATT offers a line of mono-material recycled plastics with almost the same properties as the original plastic. Together, we can make significant strides towards your sustainability goals. We support you in performing a variety of calculations – such as CO2 equivalents – and can prepare the relevant documents for authorities on your behalf. What’s more, our standards can help you achieve accreditations from internationally recognised institutions. Alongside the innovative products we offer to our customers, Polymerwerkstatt also produces various ranges of purpose-adapted compounds, concentrates and masterbatches. POLYMERWERKSTATT’s core competencies – which lie in the areas of research, development and the creation of innovative material solutions based on expert know-how – combine to give rise to a constantly expanding range of specially adapted products. These products, which are expertly tailored for their intended applications, enable us to offer our customers an excellent cost-benefit ratio. PW Nimus Masterbatches of the NU 31 Series are tailored exactly to your needs and your polymer, which means that you achieve excellent compatibility with your base material and optimal homogeneity in the plastics you use. This tailored approach enables you to impart an outstanding degree of transparency to your materials – one that is usually only achievable with amorphous glass-like plastics. Your range of applications is no longer limited to the food packaging sector, but covers technical components with particular aesthetic requirements and medical applications requiring specific approvals. The benefits in addition to the high degree of transparency are an increase in productivity and a high energy saving potential.